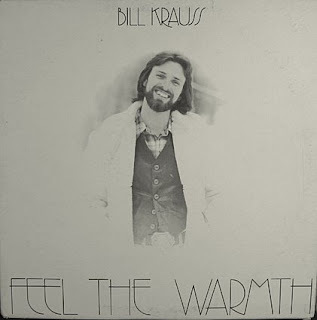 Feel The Warmth is one of the better male acoustic rock customs I’ve heard. Mostly open-aired 12-string moods with attractive synthesizer backing and sharp guitar work, both acoustic and electric. I’d say similar in some respects to early Mike Johnson solos like Lord Doctor and Velvet Prince, balancing gentle unplugged tunes with heavier electric material like ‘The Mighty Sword’ and ‘Miracles’. Bill’s quieter side has much of the dreamy relaxed acoustic approach of artists like Dennis Ryder and Ron Moore. One such piece is the beautifully moving title ballad. Light rural/country edge to ‘Livin’ For Tomorrow’ and ‘Hey Now’. Bill plays all guitars along with bass, percussion and drums. That guitar sounds a little like Phil Keaggy on the opening ‘Who Is The Giver’. Much better than Bill’s folk album with Jim Baer. (The Archivist, 4th edition by Ken Scott). 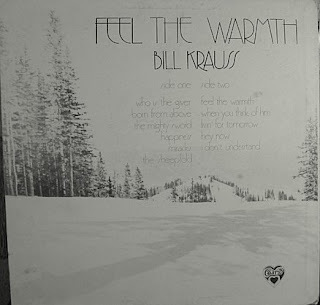 I would love to see the Bill Krauss/Jim Baer collaboration posted sometime in the near future, also. “I Believe in Jesus,” I think it was called. They performed at a youth retreat I attended in 1975. Although they were probably unknown outside Ohio, those songs are embedded into my memory, even though I haven’t heard them for 20 years or so. (No turntable.) Pretty good covers, great harmonies. I would love to hear this album again. Thanks for posting this one, too. I was unaware of its existence. Sorry I don’t have Bill’s other one. But you might check with John orr request it on the Heavenly Grooves Blog. IS THE ORIGINAL RECORDING DISTORTED? OR IS THERE SOME OTHER PROBLEM? RECORDING LEVEL TO HIGH? OR JUST BAD PRODUCTION. OTHER WISE IT SOUNDS PRETTY GOOD.